Fregoli was from an early age blessed with a remarkable gift for mimicry and impersonation, readily able to turn his voice or face into almost any character and with such lightning changes that he left audiences dumbstruck. Learning conjuring as well, and specialising in the impersonation of noted figures from politics and the arts, a typical show-stopping display was his routine where he would impersonate an entire trial - judge, jury, prosecutor, advocate and defendant, with instantaneous shifts of character. He was already an immensely popular performer when he acquired a Lumière Cinématographe (Louis Lumière was a fan) in 1898 after a visit to Lyon, and began to present films on what he renamed the Fregoligraph as part of his stage act. The films were no more than records of his various sketches, though he soon learned the possibilities of film trickery and began to employ surprise cuts and reverses. Among his Italian films were Maestri di musica, in which Fregoli impersonated a variety of composers (Verdi, Wagner, Rossini and others), Fregoli illusionista, Impressioni di Ermete Novelli (a noted Italian actor and later film star), Fregoli, danza serpentina and Fregoli dietro le scene. 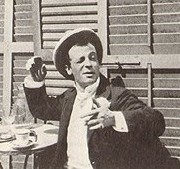 Films of his acts were also offered by Robert Paul, whose Fregoli, the Protean Artiste, in his Impersonation of Famous Composers (1898), though based on the same act as Maestri di musica, was a different film recorded when Fregoli was appearing at the Alhambra; and Georges Méliès, in whose l'Homme-Protée (1899) Fregoli played twenty different characters. His filming was, however, only a brief interlude in an international stage career that lasted many years. Fregoli was a dazzling entertainer whose exuberance and agility are readily apparent from the surviving films.